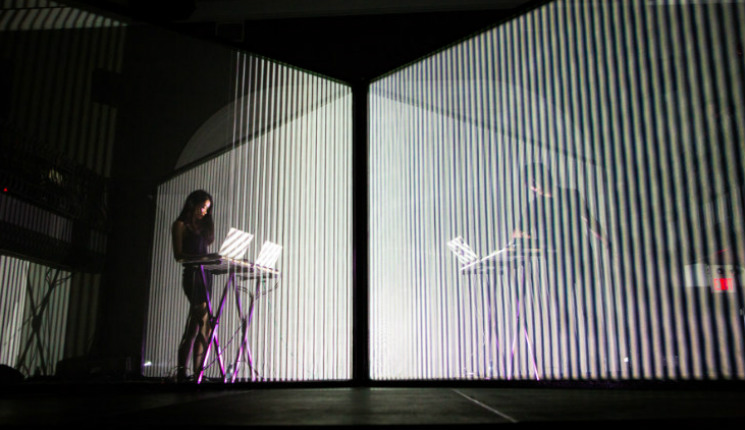 When audiences arrived at the Great Hall for night one of FORMS's concert programming, they were greeted by an augmented setup that expanded the room's stage to occupy half the space usually reserved for dance floor. Atop the giant platform sat a giant X-shaped structure built out of four intersecting translucent walls that reached up towards the room's balcony. Performing opposite each other from the interior corners of the X structure, Takami Nakamoto cued up a series of thunderous, crashing sounds on his sampler as visual artist Noemi Schipfer used projection mapping software to send bars of white light scanning up and down the crisscrossing walls of their installation. It was as if the Paris-based duo were being scanned in from some virtual world. Over the course of their performance piece "SHIRO," NONOTAK used that theme of augmented reality to immersive results. As Nakamoto's music drifted between bent and chopped frenetic techno and abstract ambient sounds, Schipfer responded with strobes and dancing lines that brilliantly saturated the otherwise translucent structure around them. The end result was an entirely immersive experience that constantly multiplied and divided audiences and performers alike, all the while unlocking new (however fleeting) worlds in the process.